The Do-335B-2 Zerstrorer version of the late war German fighter plane had two wing-mounted 30mm cannons in addition to the standard 30mm armament in the nose. Master has provided some remarkable parts to replace the kit ones. Packaged in the standard card stock backed zip lock baggie. The individual items are packaged separately to ensure that they are safe from damage. The set comprises two resin pieces, the muzzle flash suppressors, and seven beautifully turned brass parts. There are two cowl-mounted 30mm barrels, as well as the wing mounted ones which the flash suppressors are fitted to. A pitot tube is included along with a FuG-25 underwing antenna. 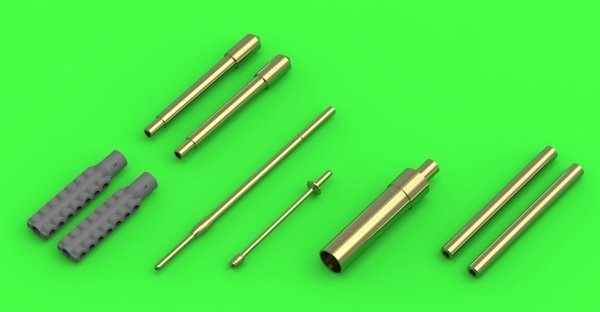 The propeller blast tube is also included and makes this set very complete. The turned metal parts provide the modeler with strength, realistic thinness and better detail. I have a hard time keeping a round cross section on plastic parts. The seam/mold line is difficult to remove and keep the parts round. Turned metal barrels alleviate this issue. They also provide more strength and resist breakage. Another very complete set from Master Model. If you haven't tried these sets, you are doing yourself a disservice. They are reasonably priced, highly accurate, easy to use and very realistic.